This may not be news to most of you, but baking parchment is great in the microwave, as well as in the oven. I wanted to bake a potato, and the lidded bowl I used to use is no longer available, so I wrapped the washed, punctured potato thoroughly in parchment, and "nuked" it for six minutes, turning it once so the spot that rests on the glass dish wouldn't be tough, and... Perfection! The parchment keeps the steam close, so the potato is tender, not tough or wrinkly. Baked potatoes, especially once they are sliced open and drizzled in hot olive oil (or even butter) with chives and a pinch of salt, are so simple and so good. Six minutes isn't long to wait for a hearty snack. 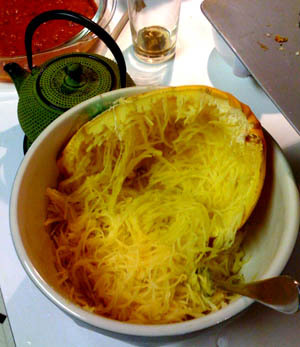 This is a photograph of a spaghetti squash. No really, it is. Take my word for it. While my winter squash mania continues, I should mention again that humble, plain looking, oblong yellow squash called "spaghetti squash," which so many people have never had. It is DELICIOUS, especially when you cover it in your favorite sauce. It is a wonderful alternative to wheat pasta: it has more crunch, texture, and fiber. It is especially delicious when baked, mixed with sauce and a ricotta-like mixture (with or without actual cheeses), and baked again as a casserole as in my spaghetti squash casserole recipe. I'm posting a picture of the baked squash here, after I've made some progress scooping out the cooked squash with a fork. It really looks like this when it is properly cooked: there is no need to process it or do anything fancy to it to make it cleave into spaghetti-like strands. It remains a very hip, very fun vegetable, one that adults and kids like to play with. On March 24th, I went to the Farmer's Market to see what our local farmers were offering despite the very cold, dry, generally strange winter we'd had. -tomatoes - which were a bad idea, because it's too early, and they were from far, far away, sold at the little stand that always has a wide range of foods, but which always look likve they've spent too long on a truck. (I suspect the stand sells conventional produce from a distributor in northern Mexico, since they often have off-season items which aren't quite at their prime.) I mixed these into a pasta sauce containing canned, diced, roasted tomatoes, capers, and garlic - their firm texture held up after simmering, which was pleasant over pasta. -strawberries - Real California strawberries!! It's early in the season, and so they're not as sweet as they'll be in a few months, but they were firm and fresh. A basket of strawberries is at least half of a perfect breakfast. -and Sukhi's Indian specialties: spinach parathas, pumpkin parathas, samosas, mint chutney, and a strange sour-cream based "paratha dip" which was too rich for me. We also bought quite a few fresh flowers, for an experiment in printing anthotypes, which I'll write about later. My favorite summer fruits and veggies are still a few months away, but it's definitely worth going to the farmer's market when I have chance to wallow in freshness, and know that I'm eating foods that are locally grown by local farmers.